Greetings friends, I am come to you from the frozen tundra that is Wisconsin! We have almost 2 feet of snow on the ground and have a -25 degree wind chill! When I say it is winter what I mean is, “Elsa has lost her dang mind with this Frozen stuff!! 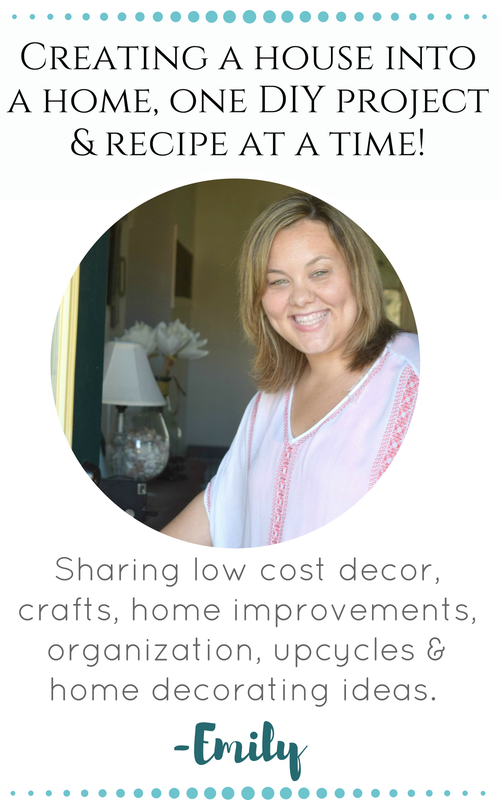 !” In light of this I am talking about How to cozy up a home with decor for winter. I currently know a lot about winter, love to talk home decor, and with it being so cold outside I am spending a lot of time hibernating. When Pottery Barn came to me about their Faux fur blankets and pillows I was excited. I decorated my home with the magical feeling that is this season, with my Christmas home. 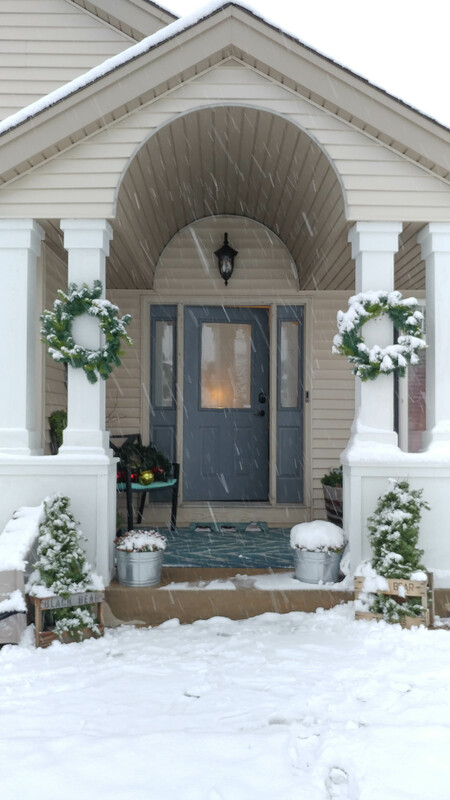 But, this time of year, regardless of the holiday season I like my home cozy. Just as a reminder, this is what I am dealing with! This, while very beautiful is not cozy. It is cold and wet. Fun to watch from the warm confines of my home, with it’s climate controlled heat. Although my kids are loving this, they can be the snow bunnies. Since I go into the holiday season singing Christmas carols you would think I enjoy winter. However, I grew up in Southern California and I go kicking and screaming into any weather colder than 50 degrees, this that we are dealing with now makes me want to layer a bunch of sweaters, sip hot chocolate and nap until spring comes. 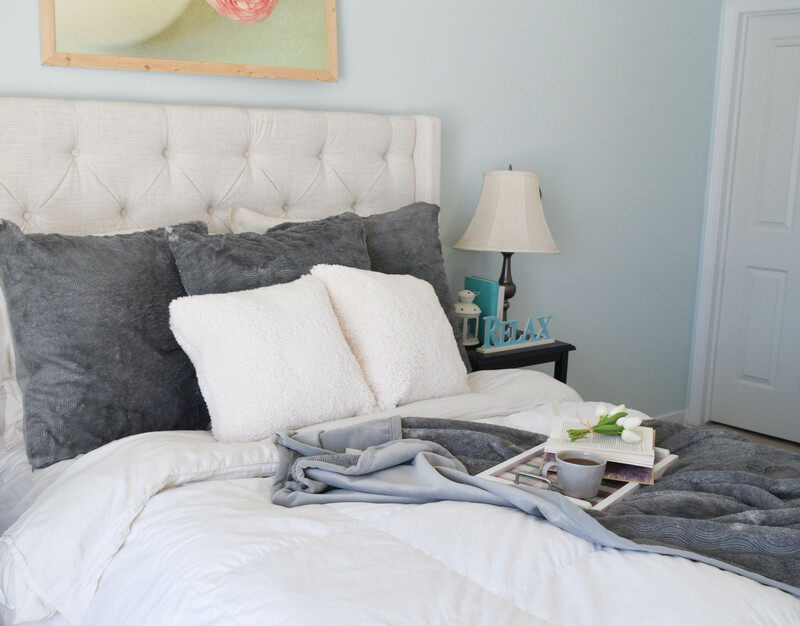 I spend my time cuddling up and relaxing in my home, typically my favorite spot to cozy up is in my bedroom. My bedroom has gone through a few changes since the last time you have seen it, mainly a new and cushy headboard. The rest of the space still works wonderfully for my needs of working and relaxing in here. This has become my quiet space. The one difficulty with having my office in my bedroom is that this bed looks so cozy it can be a distraction! 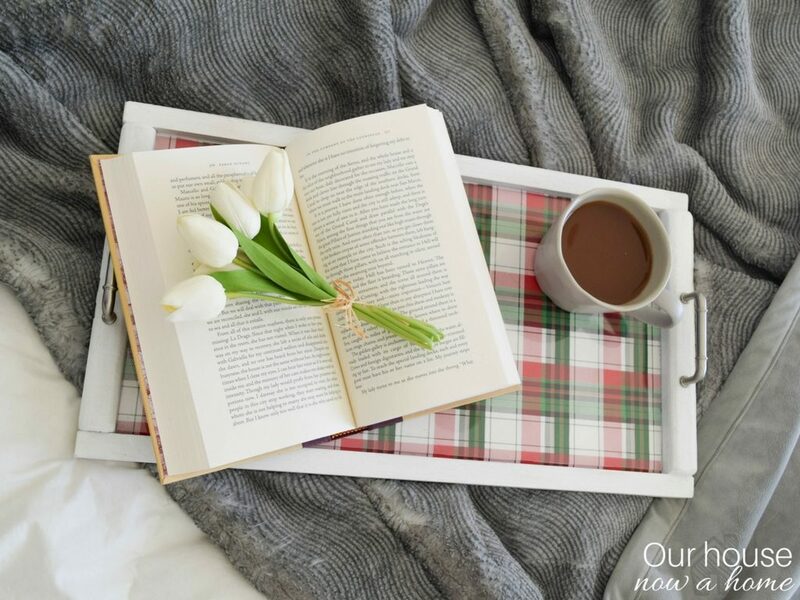 I put some plaid wrapping paper in the serving tray I made, and use it to steady a warm cup of coffee while I read. Did I mention all of my kids are in school now during the day? So I may or may not slack off, huddled up in this bed with a good book once the crew is off to school. Then I got these faux quail fur pillows and blanket and my cozy dreams became even better. You guys, this is actually my first time having Pottery Barn pillows, and even their pillow inserts are what I literally dream about in this cozy bed. They are so fluffy! I will never look back with these inserts, they fill the pillow cases so fully, which can sometimes be lacking depending on the pillow insert. Not here, you actually have to work to get the pillow insert into the faux fur case. Which I unabashedly count as my exercise for the day. 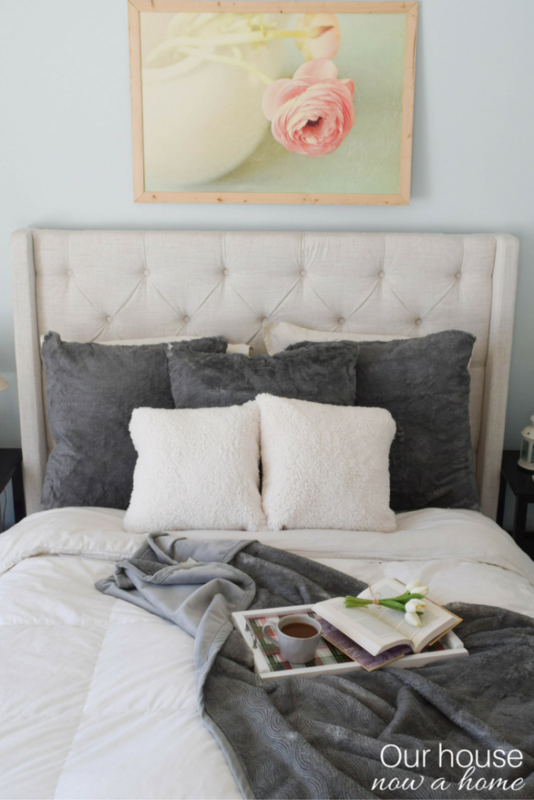 Then mix in these cute faux sheepskin pillows and the light and bright feeling to my bed pops beautifully. I also have to make the required joke of counting sheep now, while knowing no sheep were harmed in the making of these fluffy beauties! Winter is the best excuse ever to read a good book, I am all about being outdoors… but in summer. Winter I am convinced is for hibernating, staying inside nice and warm. Maybe read a book, listen to music, or snoozing the afternoon away. 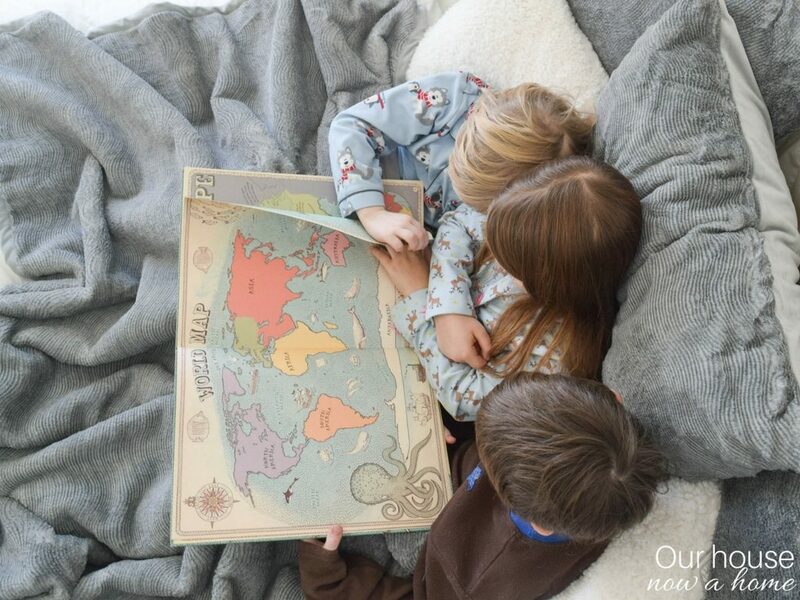 My kids have the best idea ever, explore the world from the comforts of some fluffy pillows and a cozy blanket big enough for all three of my crew. I could not keep them away from my bed while I was taking all of these pictures. The afternoon sun was shining in, we were all still in our pajamas… because… Sunday.. and it is winter. Once I took these sweet pictures I cuddled up with them and we went exploring. With a few tickles and knock-knock jokes thrown in to liven things up. Oh friends, these days I think we all need some ways to cozy up a home with decor for winter. 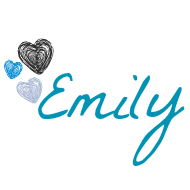 This is such a busy season and slowing down is needed to recharge. 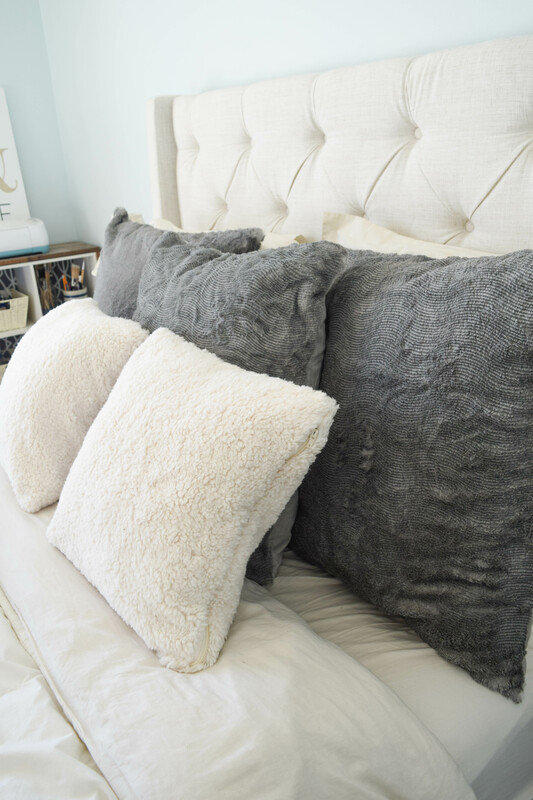 I am loving these pillows and blanket, I feel so fortunate to have a brand like Pottery Barn contact me. This is my first time ever decorating with faux fur (in Wisconsin there is a lot of the real stuff in some homes) but this is more my idea of fur. You get the cozy feelings, warming up of a space, and the fluffiest bed you have ever been, all without any little furry friends being hurt. Yes please! 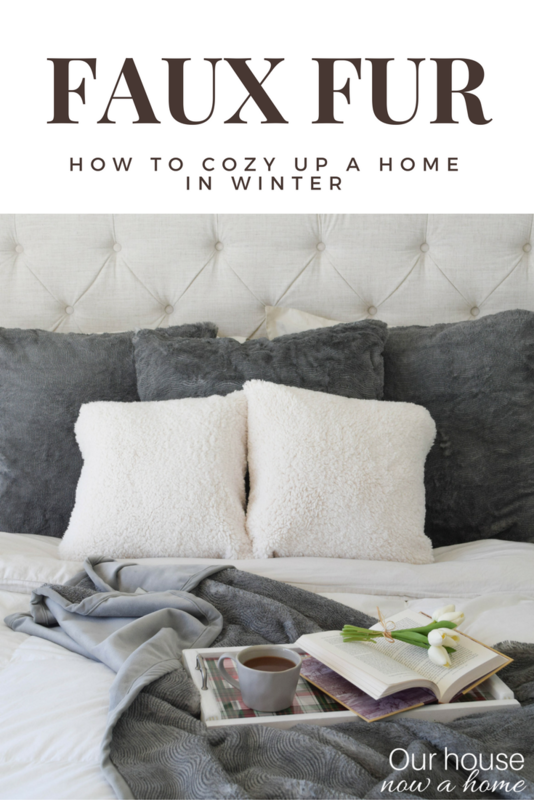 I now know that faux fur is such a simple way to cozy up a home with decor for winter! 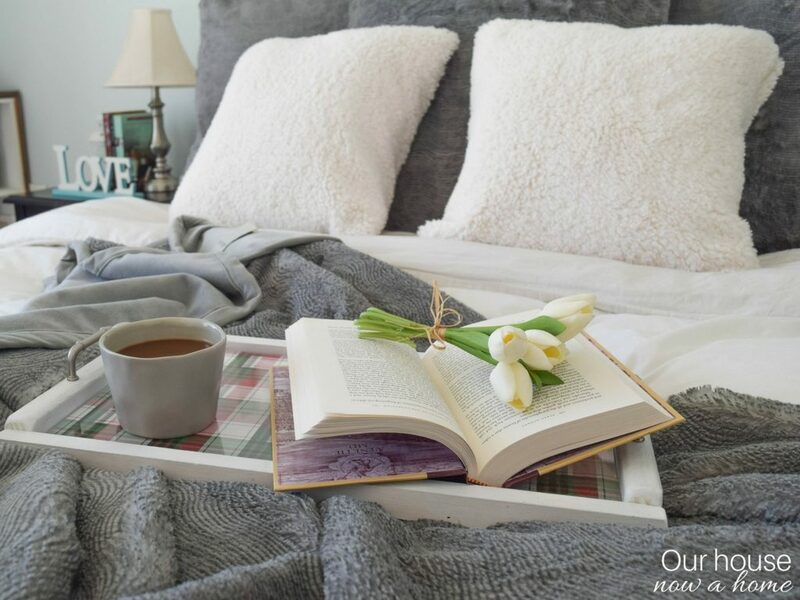 I feel like this post might give you the impression that all I do in winter is lay around, nap, read and huddle under the covers waiting for it to warm up outside. Which you would be very correct in that assumption. I am a West Coast girl stuck in a Midwest winter and fight it every year! Having a cozy bed to ignore the chill outside makes it a little less of a sting. Do you love winter? Or are you hibernating like me through the cold season? Your home looks SO cozy and comfortable! That blanket looks so soft! I hate winter!! But your bed with those pillows look so warm and comfy!!! Your home definitely looks cozy and I’m loving the pillows and blanket! It looks incredibly cozy! Love those pillows and blankets. Much needed this time of year! I love faux fur. It has such a cozy, welcoming feel to it. AND nothing had to die, which I love. I don’t go for real fur. I LOVE that! The “fur” makes it sassy, but the design is simple. It’s the best of both worlds. I love faux fur & these look beautiful!! 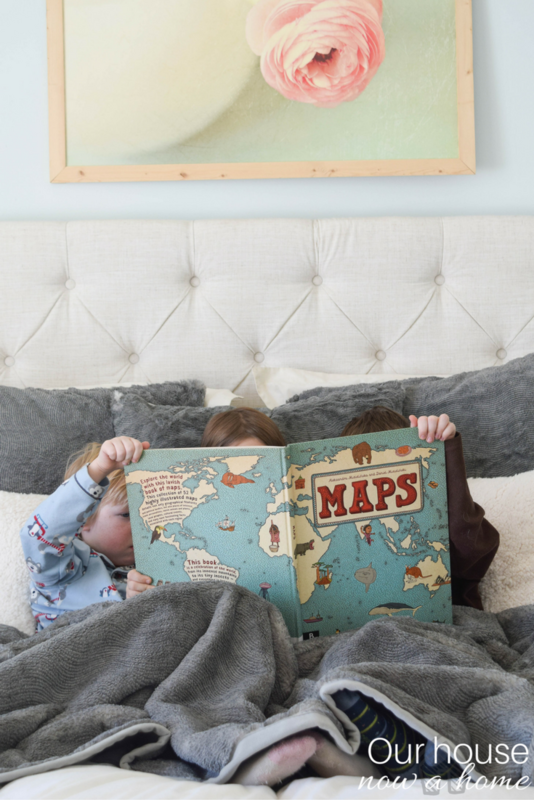 Your kids look so cozy curled up with their book! That looks so comfy! It’s been so cold here lately that I haven’t left the house in 3 days. love the cozy look of this setup! That looks so incredibly warm and comfortable! I have been looking for a new throw the bed I think I might need to get this one. I love how the bedroom is set up and breakfast in bed!! I need a bedroom makeover! Your bedroom looks amazing! 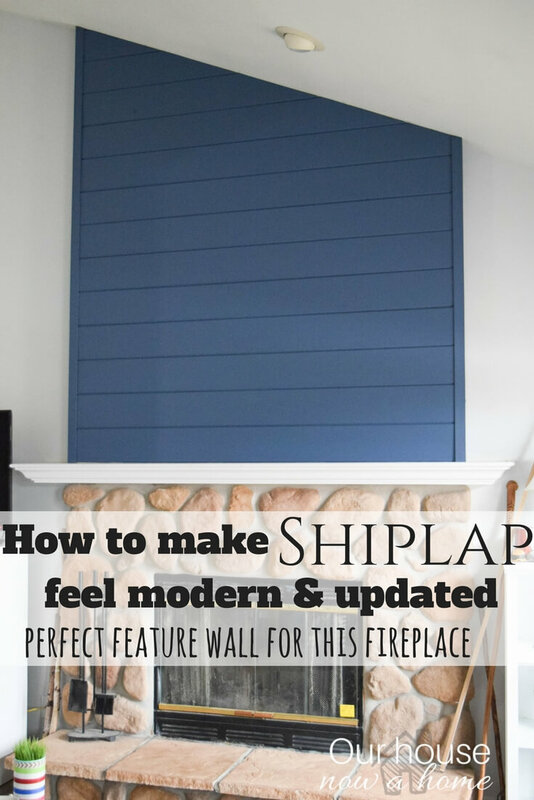 The faux fur really gives the space a cozy feel! Your one is so cozy. I love all that natural light. Gorgeous pieces to make it more cozy. 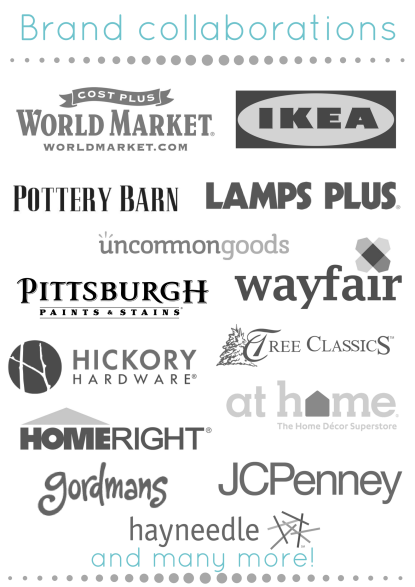 I love shopping Pottery Barn! I am loving the faux fur. I have been meaning to get some pillows like that and now I want them even more!!! Oh those fur pillows look so cozy. We had a few crazy cold days here in Boston last week too. Wind chills in the negatives and actual temps in single digits. Brrr. Well if this isn’t the coziest house I’ve ever seen then I don’t know what is! Your bedroom is amazing! I love your décor choices! I like the neutrals you’ve chosen and those pottery barn pillows look lovely! I bet the are really warm. As a Southern girl living in snowy Colorado, I can totally relate to this! Those blankets and pillows look sooo cozy. I love a warm and cozy bedroom! I need to update mine, why does it always seem like the bedroom is the last place to be decorated?? Just me?? Now, that does look cozy and those pillows are divine. Your color scheme is the same as mine. I love big cozy blankets! That one looks like the one I have on my couch! 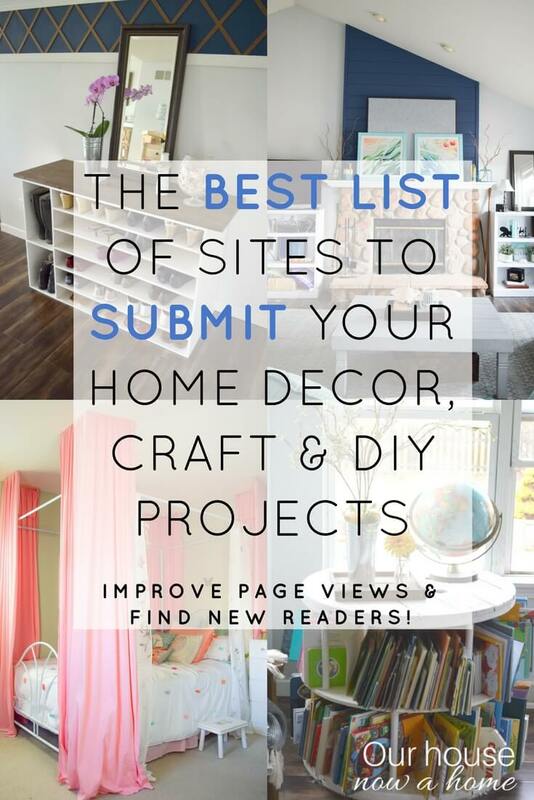 Wow, your house is beautiful, especially your room! I just love the view of the snow outside your windows. Those fur pillows and blankets are perfectly welcoming on a cold winter day! Your room is beautiful! I love the blanket it looks so warm and cozy! Love, love those pillows! Everything looks lovely. I am so looking forward to getting cozy this winter! You definitely have the right idea! 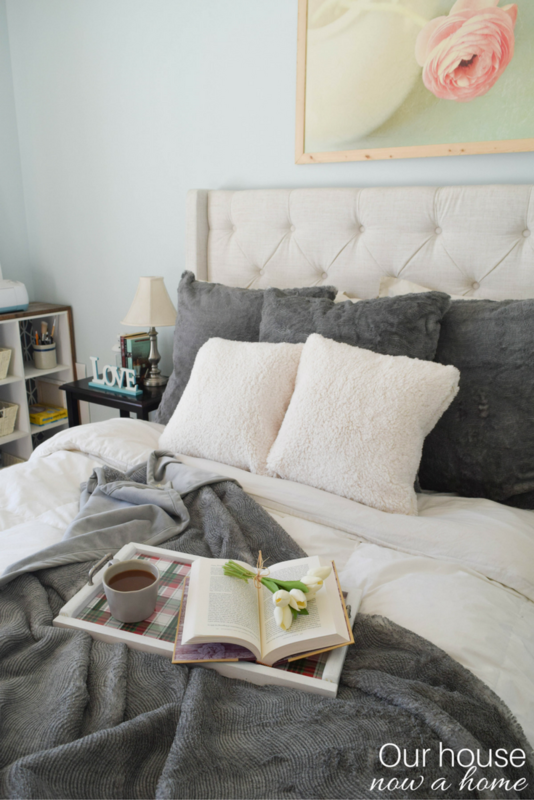 I have never used faux fur anything before, or real fur either as a matter of fact, but the pillows and blanket on your bed look so snuggly, as well as aesthetically pleasing, that I definitely want to try out some faux fur somethings now! Those look absolutely comfy! I like that they’re fake faux as well. Fake fur is the way to go! Save those animals, girl! 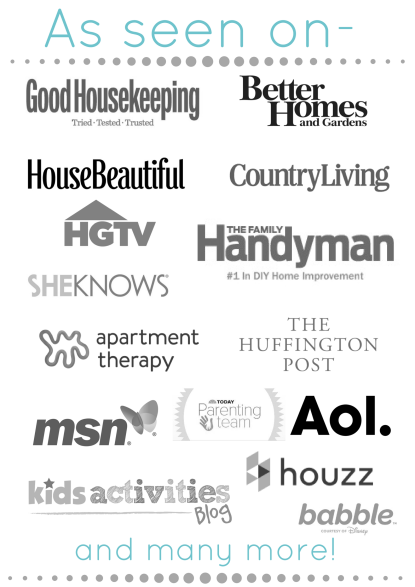 Your home looks really stunning and stylish! I love those decor ideas! Lovely bedroom! It looks so warm and comfortable. I need some of those pillows. 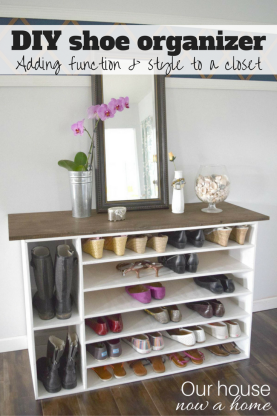 The staging that you did to your home is absolutely beautiful!! I love the grey tones that you used and of course, the faux fur! I love your color palette. The grey and ivory are perfect for this time of the year. I love the look you created! Those look so soft and comfortable! I love the way they look, perfect for reading stories as a family as well! I just moved into a new apartment and I’ve got to have some faux quail fur pillows and blanket. They would really spice up my bedroom for the winter. I love these pillows and blanket. It really warms the look of the room. I like to add a blanket to the back of my couch in the winter. Adding just the right touches can make such a difference. Your home is gorgeous. It’s in the derails! And I’m all for hibernating too. That looks so comfy. I love the look of this! I need to get some of these for my room. I would love it to look a bit nicer and be comfier too. Those pillows look super comfy. I can’t have them though because my dog steals them. She claims them as her own. We have the same problem. Anybody have tips on getting your dog to not destroy pillows? I LOVE your home! Everything is so pretty and cozy, while being light and airy! Love it! These pictures are amazing! The pictures of your sweet kids are too adorable!! Your home is so cozy, I love it! The colors are perfect for winter and that blanket they’re wrapped in – to die for! Your bedding is absolutely divine. I’m totally in love with those faux sheepskin pillows. I am with you about the hibernation. I am a FL girl suffering through GA winters. I love your color scheme. Your rooms all look so comfortable. 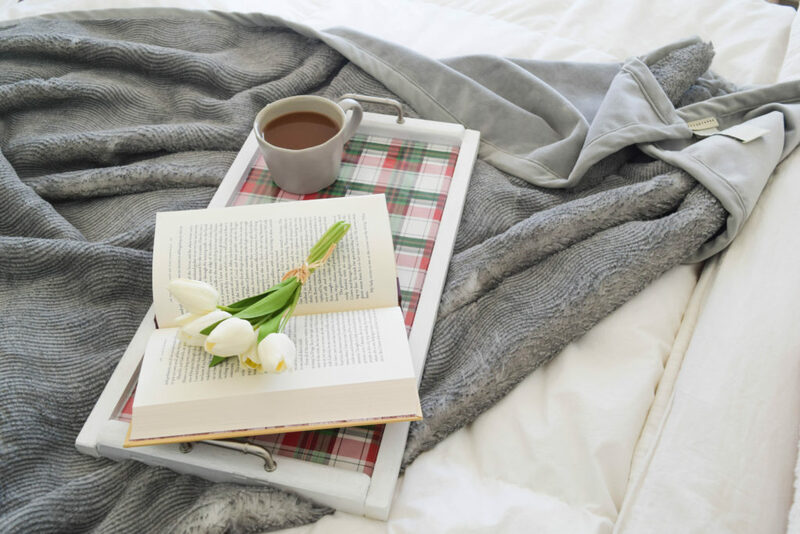 There really is nothing like snuggling under a fur blanket with a good book. Those pillows look super comfortable! I need to do my room to be more cozy now that the cooler weather is upon us. Love the fur. That is something about it that just makes home feel so cozy. Would love to have those pillows on my couch! Your bedroom is so beautiful! I love those pillows and faux furs! So beautiful – it looks SO cozy, and I love those pillows. Ohh, it makes me want to cozy up with some hot chocolate and never leave! 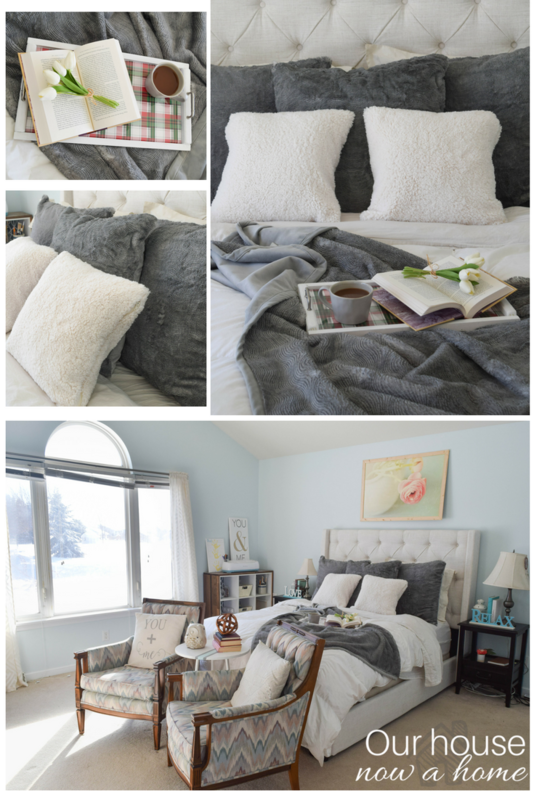 Beautiful space – and the faux fur really adds some warmth! Love it! This setup is stunning! I wish I could spend Christmas in the states just to enjoy the snow and festive vibe. Oh wow! Beautiful bedroom. I love the faux sheepskin pillows a lot!